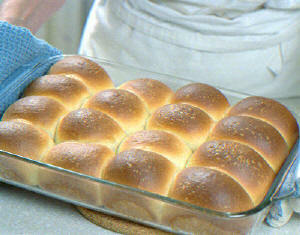 You can make the dough and shape the rolls up to a day ahead of baking. Take the recipe to the point where the rolls are shaped and in the pan but not yet proofed and immediately refrigerate them. About half an hour before you're ready to bake, transfer them to a warm place to let them proof until almost doubled before baking them. In a small saucepan, heat the milk and butter, stirring until the butter melts and the liquid is very warm, between 115 and 125 F.
Lightly grease a 9x13-inch baking pan or dish. Turn the dough onto a clean work surface (no need to flour; the dough is soft but not sticky) and gently press to deflate. Using a dough cutter, divide the dough into 16 equal pieces, each about 2 oz. (use a scale to be sure). Cover the pan with plastic and let the dough rise until almost doubled, about 30 min. Meanwhile, heat the oven to 375 F. Remove the plastic and bake the rolls until they're puffed and browned, about 20 min. Serve warm. Copyright: Fine Cooking Magazine - order Fine Cooking or send a gift subscription!